Of course, a lot of Stonehenge replicas are made of less realistic materials. Well known examples, ones we will get to, include Carhenge and Fridgehenge and Banksy’s famous henge built of portable toilets, but the henge replicas of the people, so to speak, are the food henges. Any food will do, it seems. 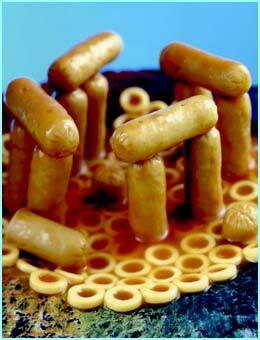 Here is a simple example, a sausage henge, complete with spaghetti-os. Not accurate or especially good looking, but this one gets extra points for using round lintels, which is touchy, and for sheer audacity! ← Restored to its former glory? Yes, in retrospect, this thing shouldn’t have gotten more than 5. But I love it–it’s so stupid it’s like Zen! Okay… I don’t get it?? ?